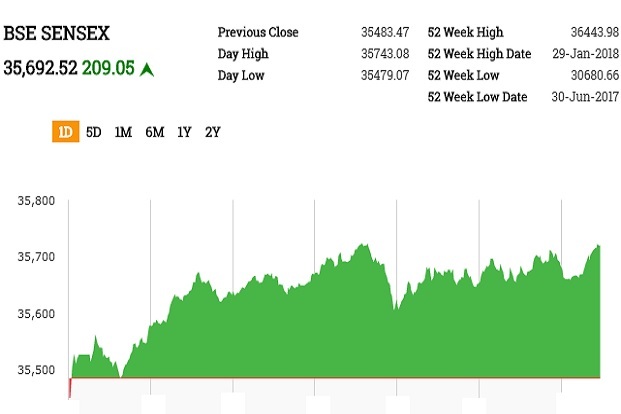 3.35 pm ISTClosing bell: Sensex, Nifty close higherBSE Sensex closed higher by 209.05 points, or 0.59%, to 35,692.52, while the Nifty 50 rose 55.90 points, or 0.52%, to close at 10,842.85. BSE MidCap and SmallCap gained 0.90% and 0.54%, respectively. Among the sectoral indices on BSE, healthcare gained most at 1.94%, capital goods 1.19%, industrials 0.81% and FMCG 0.73%. Metal, telecom, basic materials and utilities declined. On NSE, Nifty PSU Bank Index rose 2.33%. Market heavyweight RIL rose 1.32% to Rs995.40.Dr. Reddy’s Labs, SBI, IndusInd Bank and Hindustan Unilever were among the top gainers, whereas Bharti Airtel, Tata Steel, Coal India and ONGC were among the major losers. pm ISTReligare Finvest files suit against Lakshmi Vilas BankLakshmi Vilas Bank Ltd said that Religare Finvest Ltd has filed a suit against the bank’s Janpath branch. The bank held Rs794 crore in deposits related to Religare Finvest as security for loans extended to RHC Holding Pvt. Ltd and Ranchem Pvt. Ltd. On account of default in clearing the loans, the deposits were closed and the proceeds were adjusted to clear the loans. Lakshmi Vilas Bank shares were flat at Rs117.50. 2.53 pm ISTGold prices fall by Rs150 amid weak global cuesGold prices declined by Rs150 to Rs31,800 per 10 gram on Tuesday following weak global cues and muted demand from jewellers in the domestic market. Stronger US dollar against a basket of major currencies also weighed on gold prices.Global gold prices edged down as the dollar strengthened following a positive US-North Korea summit and rising prospects of an interest rate hike by the US Federal Reserve. Spot gold was down 0.1% at $1,297.96 per ounce at 12.49pm and US gold futures for August delivery were 0.1% lower at $1,301.90 per ounce.Silver prices rose past the Rs41,000-mark by gaining Rs1,110 to Rs 41,560. Globally, silver prices were down 0.1% at $16.87 an ounce. 2.25 pm ISTRupee strengthens against US dollarThe Indian rupee strengthened marginally against the US dollar ahead of key consumer price index (CPI)-based inflation data, due to be released after 5.30pm on Tuesday. At 2.07pm, the rupee was trading at 67.37 against the US dollar, up 0.09% from its previous close of 67.43. The currency opened at 67.50 a dollar and touched a high and a low of 67.36 and 67.53, respectively. The 10-year bond yield stood at 7.983% from its Monday’s close of 7.962%. Bond yields and prices move in opposite directions. 12.52 pm ISTSuven Life shares gain after patent approvalSuven Life Sciences Ltd said that it has received one product patent from each China and US corresponding to new chemical entities for the treatment of disorders associated with neurodegenerative diseases. Shares of Suven Life Sciences rose 1.66% to Rs230.10. 12.15 pm ISTOrchid Pharma shares rise 5%Shares of Orchid Pharma Ltd rose 5% to Rs7.44 after the company said it got EU good manufacturing practices certificate following the inspection of its API manufacturing facility in Tamil Nadu. The facility was inspected in November 2017. 11.30 am ISTMarket update: Sensex, Nifty trade higherBSE Sensex traded higher by 172.87 points, or 0.49%, to 35,656.34, while the Nifty 50 rose 51.35 points, or 0.48%, to 10,838.30. BSE MidCap and SmallCap gained 0.30% and 0.37%, respectively. Among the sectoral indices on BSE, healthcare gained most at 1.32%, IT 0.69%, FMCG 0.63% and teck 0.50%, while metal fell 0.84%, utilities 0.48%, power 0.42% and basic materials 0.35%. Dr. Reddy’s Labs, TCS, SBI and ITC were among the major gainers, whereas Tata Steel, Power Grid, Coal India and Bharti Airtel were among the major losers. 11.25 am ISTVakrangee shares up 5%Shares of Vakrangee Ltd hit an upper circuit of 4.93% to Rs39.35 compared the previous day’s closing. 11.03 am ISTFortis Healthcare shares fall over 1%Fortis Healthcare Ltd shares were trading 1.46% lower at Rs141.50. The board of Fortis Healthcare has extended the date for submission of binding offers by a fortnight to 28 June as the financial accounts of last year are yet to be finalized, reported Business Standard. Mint on Monday reported that the due diligence of Fortis has unearthed unpaid vendors’ bills of Rs450 crore, a Rs503 crore penalty on its subsidiary Fortis Escorts Heart Institute and undisclosed land-related issues at three of its hospitals. 10.16 am ISTMarklet update: Sensex, Nifty extend gainsBSE Sensex traded higher by 130.32 points, or 0.37%, to 35,613.79, while the Nifty 50 rose 32.35 points, or 0.30%, to 10,819.30. 10.13 am ISTUsha Martin shares jump 10%Shares of Usha Martin Ltd gained 10% to Rs32.55 after the company’s board has approved a proposal to explore the sale of its steel business, marking a shift in strategy to revive the company. The company had earlier hired an investment banker to find a buyer for its wire rope business with the aim of paying down debts of around Rs4,700 crore, Mint reported. Royal Bank of Canada was scouting for buyers for Usha Martin’s wire rope unit. Consulting firm McKinsey and Co. had advised the board on the proposed sale of the business. 9.40 am ISTStride Shasun shares gain over 4% on USFDA drug approvalShares of Stride Shasun Ltd rose 4.3% to Rs365 after the company said it got USFDA approval for generic Tamiflu capsules for the US market. As per IQVIA MAT April 2018 data, the US market for Oseltamivir Phosphate Capsules was approximately $725 Million. The product will be manufactured at the company’s Oral dosage facility at Bangalore and will be marketed by Strides Pharma in the US Market. The company has 75 cumulative ANDA filings with USFDA of which 48 ANDAs have been approved as of date and 27 are pending approval. 9.30 am ISTMarket update: Sensex, Nifty trade marginally higherBSE Sensex traded higher by 56.48 points, or 0.16%, to 35,539.95, while the Nifty 50 rose 25.55 points, or 0.24%, to 10,812.50. 9.27 am ISTRupee edges lower against US dollar ahead of CPI inflation dataThe Indian rupee weakened marginally against the US dollar in opening trade on Tuesday ahead of key consumer price index (CPI)-based inflation data due to be released after 5.30pm. The home currency was trading at 67.49 against the US dollar, down 0.09% from its previous close of 67.43. The currency opened at 67.50 a dollar. The 10-year bond yield stood at 7.972% from its Monday’s close of 7.962%. Bond yields and prices move in opposite directions. 9.25 am ISTUS dollar surges, Asian stocks volatile as Trump-Kim summit beginsThe US dollar jumped to a 3-week top on Tuesday while stock markets in Asia were choppy as an historic US-North Korea summit began in Singapore, raising some hopes it could pave the way to ending a nuclear stand-off on the Korean peninsula. Trading was volatile as MSCI’s broadest index of Asia-Pacific shares outside Japan seesawed between positive and negative territory. It was last flat, while Japan’s Nikkei pared early gains to be up 0.2% from as high as 0.9%.South Korean shares slipped 0.1% while Chinese shares were in the red too with the blue-chip off 0.4%. Australian shares were a tad firmer. The lead from Wall Street was mixed overnight, with the Dow barely changed, the S&P 500 up 0.1% and the Nasdaq adding 0.2%.